San Francisco's Cole Valley is tucked away at the south-eastern end of Golden Gate Park in the geographical center of the City. It is a neighborhood that defines charm. 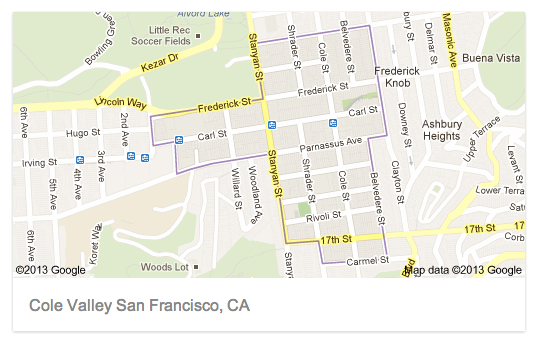 Shady, tree lined streets and well maintained homes offer up a quiet slice of San Francisco life. The intersection of Cole and Carl Streets marks the business center where locally owned bakeries, cafes and restaurants are a culinary delight. Residents enjoy easy access to Golden Gate Park while a short trip on the N-Judah can drop them at Ocean Beach or Downtown. A steep walk from the center of the neighborhood is Tank Hill, where near 360 degree views of the cityscape are guaranteed to please. Despite its proximity to the Haight, anyone who has spent time in this small community in San Francisco knows Cole Valley has a distinct character all its own. "Community" is the operative word of this particular San Francisco real estate, bordered on the west by Stanyan Street and the Sutro Forest, on the south by Tank Hill and on the east by Clayton Street. Residents are largely families and young professionals, though there is no trace of the snootiness that has affected other parts of the city. Most of the businesses in Cole Valley are of the mom-and-pop variety, in lieu of chain stores or franchises, and shop owners are outwardly supportive of each other. Food and coffee are the specialties in Cole Valley, as in San Francisco in general. In the three-block commercial strip along Cole Street and part of Carl Street, there are more than a dozen restaurants and cafés, some of which draw visitors from around the Bay Area., Zazie, for instance, is a magnet for locals on weekends for brunch. For historians and old-timers, traces of Cole Valley's past are still visible. Above the Crepes on Cole awning, along the Carl Street side, remains the old sign for the Other Café, a comedy spot where Robin Williams and Dana Carvey performed before they hit the big time. Even more historic are the photos in the Kezar Bar and Restaurant dating from the early 1900s, when the region was home to dairy farms. Cole Valley may not be one of the city's most bustling tourist destinations, but it makes for a relaxing respite from the Haight, and there are enough attractions for a day's outing. Looking for the Cole Valley Improvement Association (CVIA)? We are not affiliated with CVIA but we love working with them to help keep Cole Valley great. Visit CVIA here. Adapted from www.nabewise.com, from Marlene Goldman, Special to SF Gate (12/01).